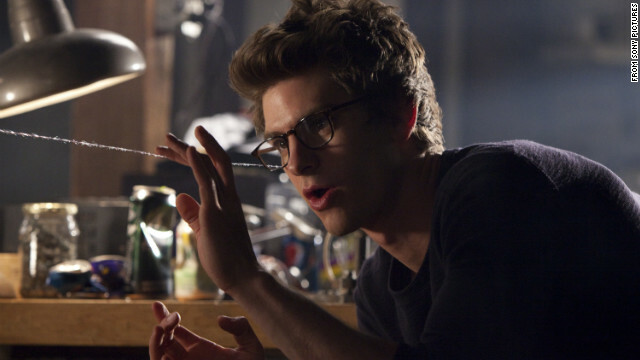 Can you tell whether Peter Parker, as played by Andrew Garfield, is a nerd? Spider-Man: Still a nerd at 50? The very first page set the tone. "Amazing Fantasy" #15 presented an image of a bespectacled, oft-tormented high school science whiz named Peter Parker. As bully Flash Thompson poked fun, Peter's shadow formed the silhouette of Spider-Man – a character who would use both his spider-powers and his intelligence to defeat larger opponents. It was unheard of for a teenager, especially one with lots of personal problems, to be a superhero in comic books back in 1962. "A teenager can’t be a superhero, he can only be a sidekick," co-creator Stan Lee remembers being told by his publisher. And as for heroes with personal problems, forget it. But this nerd almost immediately struck a chord with comic book readers. "Peter was an outsider, and that was me in high school," said artist Mark Bagley, who related to the hero of "The Amazing Spider-Man" and ended up working as the artist on that book years later. At the start of his near-decade run on "Ultimate Spider-Man," Bagley was dealing with the unsavory mandate of "beefing up" Peter Parker in "The Amazing Spider-Man" books. Determined to save Peter Parker's nerd cred, he decided that "Ultimate's" hero would always be skinny. He saw that physical trait as an important reminder of Peter's underdog status, something key to the character’s popularity. That was true for Brad Douglas of fansite SpiderManCrawlspace.com, too. "He has problems just like you," Douglas said of the classic version of Peter Parker. "He can't pay his bills, he can't get a girl, when he does he has to ditch her to go fight bad guys. His costume rips."